Remove any PCIe card in PCIe slot 3 and the internal HBA in PCIe slot 4. See Remove a PCIe Card From PCIe Slot 3 and Remove the Internal HBA Card and HBA Super Capacitor. Note - You do not need to remove the data cables from the PCIe cards when servicing the M.2 mezzanine. Extract the PCIe cards (with cables attached) from the PCIe slots and set them aside. Using a T10 Torx screwdriver, remove the screws that secure the M.2 mezzanine to the PCIe riser. 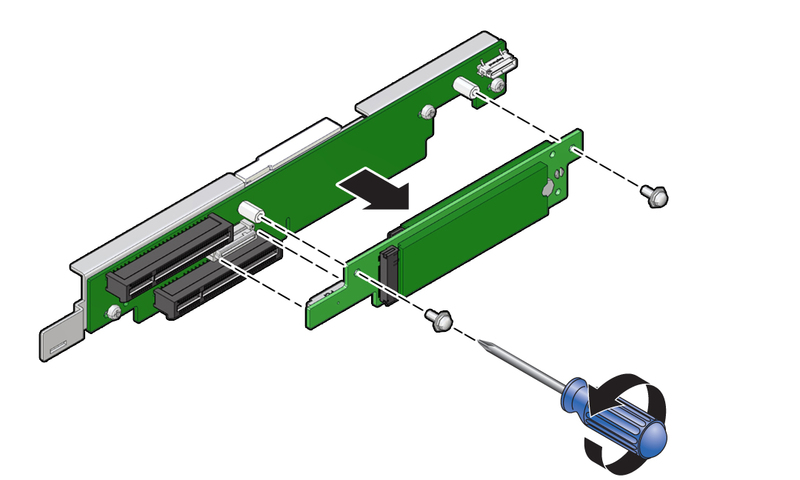 Lift and remove the M.2 mezzanine from the PCIe riser connector. Place the M.2 mezzanine on an antistatic mat. If required, perform the procedures for removing the M.2 flash SSDs from the mezzanine. See Remove an M.2 Flash SSD.